A review of literature showed that the data regarding knowledge, attitudes, and practices toward medical research among resident doctors pursuing postgraduate studies in India, is lacking. It is felt that the existing level of knowledge and awareness among the second and third year resident doctors who have already conducted / are conducting at least one research study for their dissertation should be evaluated. So, we decided to undertake a cross-sectional study to assess research-related knowledge, attitude, and practices of resident doctors of a medical college affiliated to a tertiary care hospital in western India. We conducted a cross-sectional survey during the period between September and October 2010. Out of a total of 420 residents who were admitted to the MD/MS course, we enrolled 100 residents; pursuing their second and third years of residency, from all the specialties. Those residents who had started or completed at least one research project were approached by word-of-mouth communication and the questionnaire was administered to them after seeking verbal consent. We developed a pre-tested, structured questionnaire based on our study objectives, taking guidance from the previous literature. ,, It was subjected to a thorough peer review by five senior teachers from the college. The questionnaire was also administered to 10 resident doctors to validate its content. It was subsequently modified as per suggestions of the teachers and resident doctors and the final questionnaire consisted of 29 multiple choice questions. The questionnaire consisted of several parts. The first part pertained to a collection of demographic information of the residents: Age, gender, academic year, and faculty. The questions in the second part of the questionnaire assessed the residents' knowledge about research methodology and statistics, and their attitude toward research. The third part of the questionnaire addressed questions related to their practices in research, for example, studies conducted earlier other than the dissertation, oral or poster presentation in national and international conferences, participation in workshops, publications, and prior training in research methodology. The data was expressed in percentage and was analyzed using descriptive statistics. Out of 100 residents recruited in the study, 50 were in the second year of residency, while the remaining 50 were in the third year. A total of 46 residents were from clinical specialties and 54 were from pre- and para-clinical specialties. The data related to the knowledge domain is presented in [Table 1]. 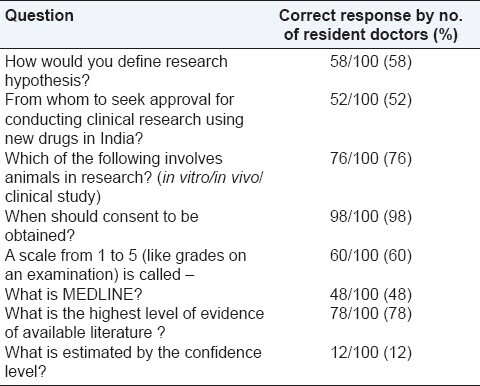 The responses regarding the attitude of residents toward research are summarized in [Table 2]. Although 84% of the residents agreed that resident doctors should be involved in medical research, a majority (86%) agreed that a separate time should be allotted in the curriculum for research activities. The data regarding research practices is presented in [Table 3] and [Table 4] and in Figure[Figure 1] and [Figure 2]. 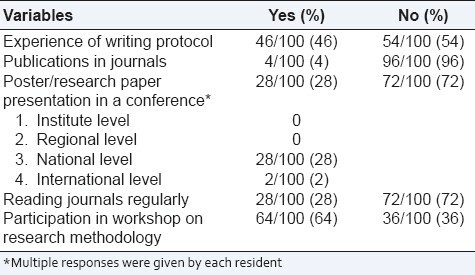 Although 64% of the residents had attended research training workshops, very few of them pursued active research, as only 4% of them had published articles and 28% had presented research papers at a national conference. Only 28% of the residents stated that they read journals regularly. The residents were asked to specify research-related topics for which they needed to be trained. 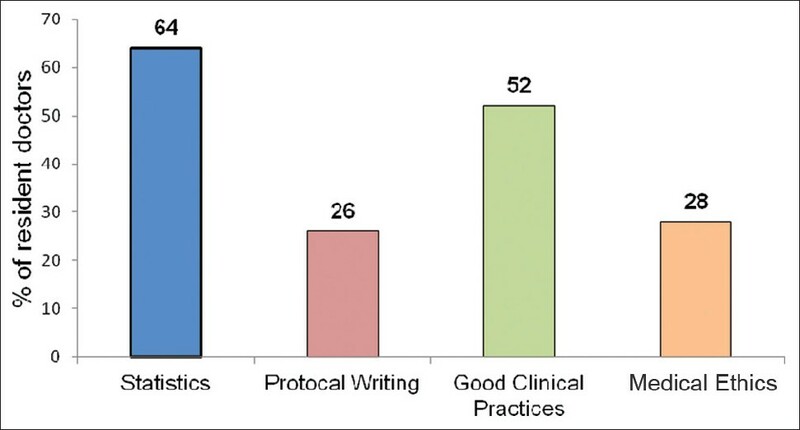 The topics of research training of interest to the resident doctors are shown in [Figure 2]. 'Lack of time' was cited as an obstacle for research by 74% of the residents, of which 66% felt that training in their specialty consumed most of their time and 42% of the residents admitted 'lack of research curriculum' as an obstacle. The residents were asked to state factors that could promote research. Most of them (66%) admitted that guidance from senior faculty was essential. Forty-six percent thought that reduction of working hours of residency could lead to more research involvement and 40% felt that financial assistance would help to promote research. Forty-four percent considered that a system of extra credit points for research-related presentations and publications would be helpful. Postgraduate students are introduced to the concept of designing and conducting research during residency. Medical research carried out by undergraduate and postgraduate students in India is disappointing compared to developed countries. To date research has not become a mandatory part of the curriculum of undergraduate medical education in India. In Germany, where research is an integral part of undergraduate medical curriculum; medical students were involved in 28% of the publications in a particular institution. A study reported that in a European country, Croatia, 23% of the undergraduate students were involved in research projects. We carried out this study to assess the awareness of residents toward research and to find out whether the current methods of training and facilities are adequate to foster a research culture in postgraduate students. This study showed various key findings that would be of interest to medical educators and policy makers. It was found that knowledge about the need and prerequisites of research was fairly good among resident doctors. Furthermore, they also showed a positive attitude toward medical research. However, there was disparity found with regard to their attitude toward medical research and actual participation. Although a majority of the postgraduate medical residents wished to get involved in research, very few had participated in research work, other than the mandatory dissertation project. Moreover, very few had presented research papers at conferences or had publications. Discrepancy between attitude and practice was also highlighted in a study done in Faisalabad, in India. Although a large majority of postgraduate trainees of the Allied Hospital in Faisalabad appreciated the importance of reading current literature, only a few actually read journals and were actively involved in presenting research papers and making scientific contributions to the literature. Similar results were obtained in a study done in Madison, in USA. Out of 143 postgraduate students, 85% felt that research experience was desirable, 48% were interested in pursuing research during residency, and only 8% were active in research. However, two studies that were carried out in Canada and Pakistan reflected a contrasting attitude of residents that a majority of time in residency should be spent learning the clinical aspects of their specialty and they were unwilling to sacrifice personal time for research. , In our study, residents reported significant barriers impeding research during residency, such as, lack of time, inadequate guidance from teaching staff, and financial support. Similar obstacles for research among residents have been reported in a study done by Khan et al. Residents were interested to learn statistics, Good Clinical Practices, medical ethics, and protocol writing. Hence, a research curriculum considering these topics should be formulated. Formal evaluation should also be done during university examinations, to ensure that resident doctors learn these aspects. Medical teachers should be trained in research methodology and they should motivate their postgraduate students in undertaking research. It is suggested that not only the teaching abilities, but the research experience of a teacher could be assessed at the time of their appointment by the university. As lack of time due to clinical work was cited as the main obstacle by a majority of resident doctors. Before starting the research study, the protocol should be discussed by the faculty members and the research study should be planned. The faculty members should not only assess research work periodically, but also provide the necessary information and guidance to resident doctors. Lack of research curriculum was also cited as a hurdle in the present study by most of the resident doctors. For training in research methodology, medical colleges should conduct training programs. For encouragement of medical postgraduate students, a system of rewarding the best thesis study may be started. Conferences and workshops specially organized for resident doctors should be conducted. Journal editors can encourage research among postgraduate students by having a policy to give priority to the thesis articles that have won awards. When offering jobs in government and private medical sectors and admission to super-specialty courses, preference could be given to resident doctors who have carried out and published research studies. We recognize several limitations of our study. First, our study was based on the convenience sampling method, including only 100 residents, thus the residents who completed the survey may not reflect the knowledge, practices, and attitudes of all postgraduate residents. Second, this study involved only one medical college, further limiting the generalization of our results. Third, we could not include the questions that reflected a broad range of topics in the research for evaluation of the knowledge aspect of resident doctors. 1. Sackett DL, Roseberg WM, Gray JA, Haynes RB, Richardson WS. Evidence based medicine: What it is and what it is isn't. BMJ 1996;312:71-2. 2. Bhatt A. The Challenge of growth in clinical research: Training gap analysis. Mumbai: Pharma BioWorld 2005. p. 56-8. 3. Gupta BM, Bala A. A scientometric analysis of Indian research output in medicine during 1999-2008. J Nat Sci Biol Med 2011;2:87-100. 4. Requirement for Research Oriented Medical Education in India in Entrance Exams 2012 Education and Career in India. 2011. Available from: http://entrance-exam.net/requirement-for-research-oriented-medical-education-in-india/. [Last accessed on 2011 Nov 15]. 5. Deo MG. Undergraduate medical students' research in India. J Postgrad Med 2008;54:176-9. 6. Post Graduate Medical Education Regulations 2000. Available from: http://www.mciindia.org/RulesandRegulations/PGMedical Education Regulations2000.aspx. [Last accessed on 2011 Nov 14]. 7. Medical Council of India Postgraduate Medical Education regulations, 2000. Available from: http://www.mciindia.org/rules-and-regulation/Postgraduate-Medical-Education-Regulations-2000.pdf. [Last accessed on 2011 Nov 14]. 8. Vodopivec I, Vujaklija A, Hrabak M, Lukiæ IK, Marusiæ A, Marusiæ M. Knowledge about and attitudes towards science of first year medical students. Croat Med J 2002;43:58-62. 9. Sumi E, Murayama T, Yokode M. A survey of attitudes toward clinical research among physicians at Kyoto University Hospital. BMC Med Educ 2009;9:75. 10. Silcox LC, Ashbury TL, Vandenkerkhof EG, Milne B. 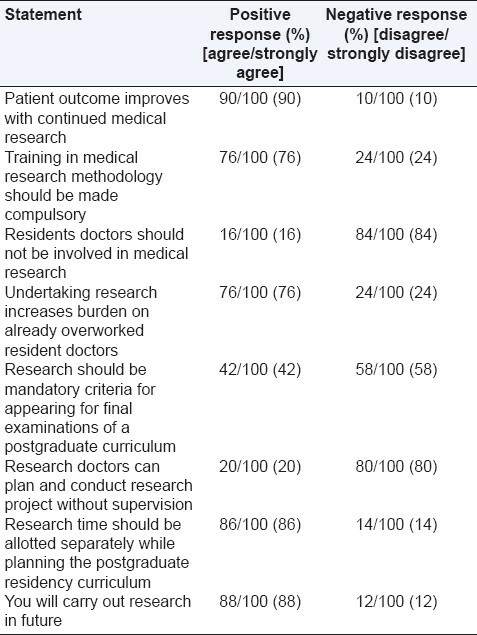 Residents' and Program Directors' Attitudes Toward Research During Anesthesiology Training: A Canadian Perspective. Anesth Analg 2006;102:859-64. 11. Cursiefen C, Altunbas A. Contribution of medical student research to the Medline-indexed publications of a German medical faculty. Med Educ 1998;32:439-40. 12. Kolciæ I, Polasek O, Mihalj H, Gombac E, Kraljeviæ V, Kraljeviæ I, et al . Research involvement, specialty choice, and emigration preferences of first year medical students in croatia. Croat Med J 2005;46:88-95. 13. Aslam F, Qayyum MA, Mahmud H, Qasim R, Haque IU. Attitudes and practices of postgraduate medical trainees towards research- A snapshot from Faisalabad. J Pak Med Assoc 2004;54:534-6. 14. Temte JL, Hunter PH, Beasley JW. Factors associated with research interest and activity during family practice residency. Fam Med 1994;26:93-7. 15. McCrindle BW, Grimes RB. Will pediatric residents do research? A survey of residents' attitudes. Ann R Coll Physicians Surg Can 1993;26:283-7. 16. Khan H, Khan S, Iqbal A. Knowledge, attitudes and practices around health research: The perspective of physicians-in-training in Pakistan. BMC Med Educ 2009;9:46. 17. Rajadhyaksha V. Training for clinical research professionals: Focusing on effectiveness and utility. Perspect Clin Res 2010;1:117-9.